India hosted the 6th Heart of Asia (Istanbul Process) conference in Amritsar on December 3 and 4. The Heart of Asia (Istanbul Process) conference on Afghanistan, held in Amritsar, close to the India Pakistan border, saw a renewed focus on terrorism and connectivity. There were “three big issues” which emerged from the sixth Ministerial Meeting of the ‘Heart of Asia’ (Istanbul Process) conference on Afghanistan, held in the northwestern Indian city of Amritsar over the weekend. The three issues were countering terrorism to create stability and security in Afghanistan; providing Afghanistan connectivity to strengthen economic activities and development, which is essential for the progress of Afghanistan. For the first time, a Heart of Asia Declaration has expressed concern at the violence caused in Afghanistan and the region by terrorist groups like Al Qaeda, Daesh (ISIS), LeT (Lashkar-e-Toiba) and JeM (Jaish-e-Mohammed) and so on. Seeking concerted international cooperation to end the terrorist onslaught, the Declaration also sought early finalization of the draft Comprehensive Convention on International Terrorism and an early meeting of experts to discuss a draft Regional Counter-Terrorism Framework Strategy, recently prepared by Afghanistan, for its early finalization. Terrorism assumed centre-stage and it was mostly directed against one country, Pakistan. Afghan President Mohammed Ashraf Ghani, who inaugurated the conference, launched a frontal attack on terrorism emanating from Pakistan and even appeared to turn down a Pakistani offer of $500 million for the Afghanistan Reconstruction Fund. “This fund, Mr Aziz, could very well be used for containing extremism because without peace any amount of assistance will not meet the needs of our people,” said President Ghani, directly naming Sartaj Aziz, Advisor on Foreign Affairs to Pakistan’s Prime Minister Nawaz Sharif. This kind of direct “attack” on a participant at an international conference is not usual. Indian and Afghan leaders had met earlier to formulate a joint plan to raise the issue of countering terrorism, but Indian officials told RIR that the Afghan President’s “attack” on the Pakistani representative had “surprised” them. “I’m sure that President Ghani has strong reasons to do so (name Mr Aziz) but I don’t think that the Heart of Asia is the right place for settling scores between member states,” said Zamir Kabulov, the Russian President’s Special Envoy on Afghanistan. “We believe that Heart of Asia is a dialogue platform which can complement but can’t supplement the existing well-known regional relations,” he said, and urged India and Pakistan not to use the forum for “scoring points.” Kabulov was speaking to some reporters after the conference concluded. With regional connectivity as the other main theme of the conference, Kabulov said, “what the Indian Prime Minister and the Afghan President said on regional connectivity to Eurasia is along the lines of the Russian thinking. Afghanistan can become the bridge between Central Asia and South Asia,” he said. Kabulov represented Russia in the Heart of Asia conference where he articulated Moscow's position on Afghanistan's transition. He said all major players, including India, must extend all possible support to Afghanistan in its transition. 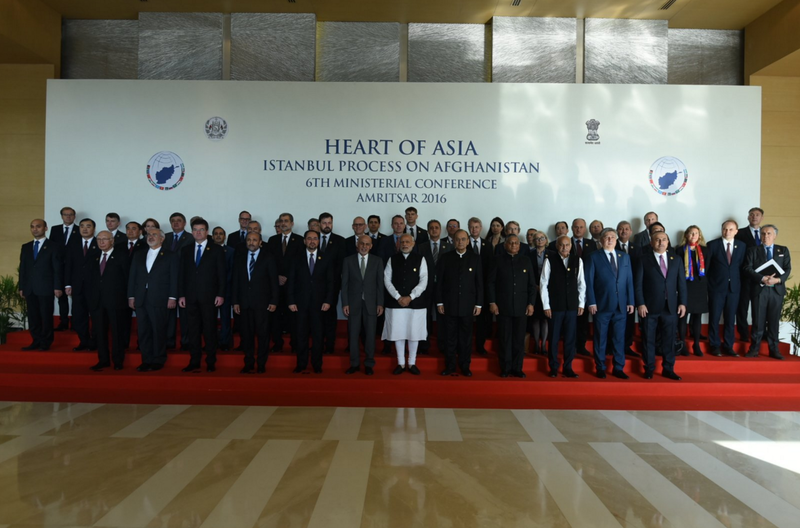 India hosted the 6th Heart of Asia (Istanbul Process) conference in Amritsar on December 3 and 4. The HoA, which was launched in Turkey in 2011, seeks to bring regional countries together to support peace and stability in Afghanistan. The meeting in Amritsar was attended by foreign ministers (including Javad Zarif of Iran) and other high-level representatives (Kabulov)from the 14 other ‘Heart of Asia’ member countries, which include, besides Afghanistan, Azerbaijan, China (Assistant Foreign Minister), India, Iran, Kazakhstan Kyrgyzstan, Pakistan, Russia, Saudi Arabia, Tajikistan, Turkey, Turkmenistan, the UAE and Uzbekistan. The US, Britain, Canada, Australia, Japan, and the EU and international organizations serve as “supporting nations” to the process. Amritsar was specially chosen as the venue for the conference because of its symbolic value. “Amritsar was chosen because it is located on the Grand Trunk Road, for centuries a traditional trade route linking India to Afghanistan and beyond,” an official told RIR. The city is less than 50 km to Lahore in Pakistan, 450 km to the Khyber Pass on the Pakistan-Afghanistan border and 620 km to Kabul, the capital of Afghanistan.